Sandro Botticelli created during the transition from quattrocento to the High Renaissance, but in his art there is little joy in the first and breathtaking grandeur of the second. The artist in general, everything is special – figures and faces, lines and forms, even the law of universal gravitation has his own: his characters always float slightly above the ground. In this small-sized painting, Gabriel, when she appeared to Mary, is still flying, which is evident not only from his fluttering wings and the white train that swells behind her back, but also through the air that fills the archangel’s clothes. And Mary, though bent on one knee, as if standing on the air cushion, which carries Her to the messenger. This flight to meet each other visually suspends only the colonnade with a light drapery, separating the characters. The movement is felt in the angelic attire, the folds of which lie in freaky waves, and in the flowing white curtains of the columns, but it is somewhat restrained by the strict architecture of the interior. The artist’s colors are deep, but also airy. In the cloak of Mary – the intense blue of the heavens and the seas. The sense of color in Botticelli was so subtle that there are many shades of white in the picture: the color of the angelic garment, wings, lilies, marble column or drapery is different. And all paints painter – like washed, new, no one has yet used. His paintings always reigns in the morning. The years when Botticelli created this “Annunciation”, “for talented people were truly a golden age,” wrote Giorgio Vasari. This time Lorenzo the Magnificent and his circle, which included the artist, where they were engaged in the arts. This is the heyday of Florence. 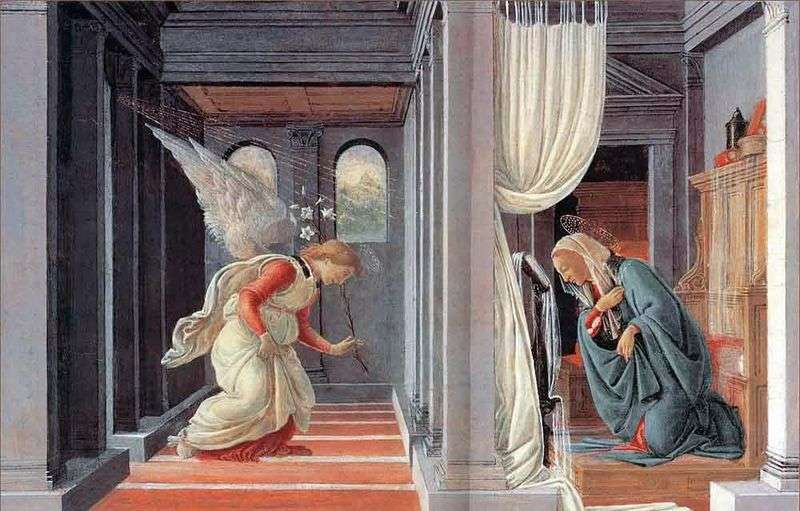 Description and meaning of the painting Annunciation by Sandro Botticelli.